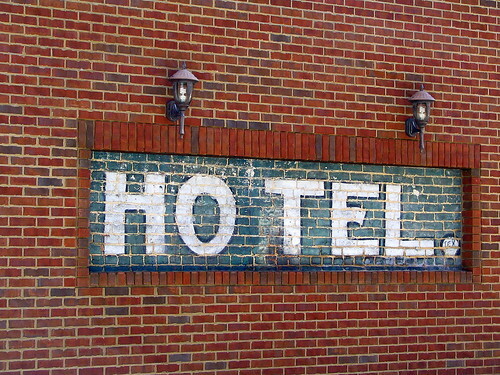 it looks like it also said "Near Chattanooga, Tenn" but some of those boards have been missing for many years. 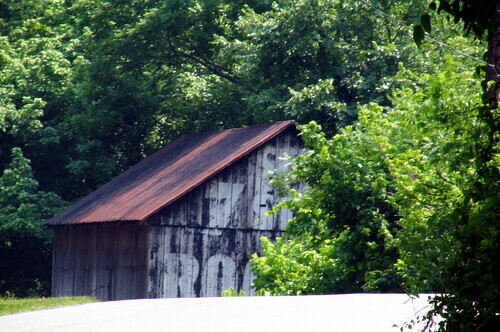 This barn is visible to the southbound traffic on highway US 11E between Bull's Gap and Whitesburg in Hamblen Co., TN. 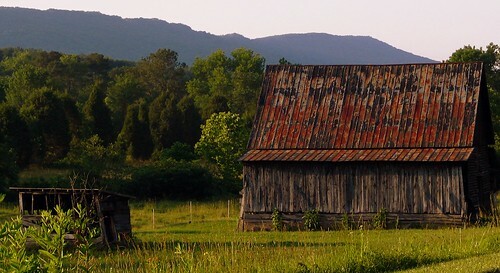 When Clark Byers first painted the barn, it belonged to James Self. For many years, the way to move from town to town was by train. Then, over time, better roads and airplanes made passenger trains obsolete. This left many of the small town train depots vacant. Fast forward a couple of decades, and many small towns had to decide whether they were going to allow their stations to continue to decay. Sometimes, they were purchased to becomes someone's business. Better yet, many cities decided to try and preserve their depots to remember their railroad heritage. A community preserved passenger depot would open as a museum, often with free admission. Inside, the museum would display whatever railroad memorabilia they could get locals to donate. Outside, they would like to get some trains, and many would acquire a steam locomotive, or more frequently a caboose, which the railroad companies don't really utilize often anymore. Many of the railroad museums operate on a shoestring budget, relying solely on donations and work from volunteers. 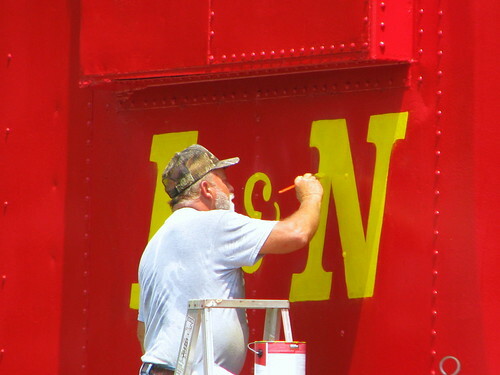 One such volunteer is seen here hoping to restore an L&N Caboose to its former glory. This is seen at the depot museum in the small town of Lynnville, TN in Giles County. I last saw this caboose in 2008, and at the time, its faded red surely needed a paint job. I'm glad to see that it was able to happen. It's that time of year where there are places all over that want to sell you fireworks. Big Daddy's Fireworks - Right off Interstate 24 at the US72 Jasper exit in Kimball, TN. There's no way you could miss it, but if you did, this is the arrow into the parking lot. In 1909, a famous statue of President Abraham Lincoln was placed in the town square of Hodgenville, KY, since he was born just a few miles down the road. 99 years later, on May 31, 2008, this statue of Lincoln was added to the other side of the square. 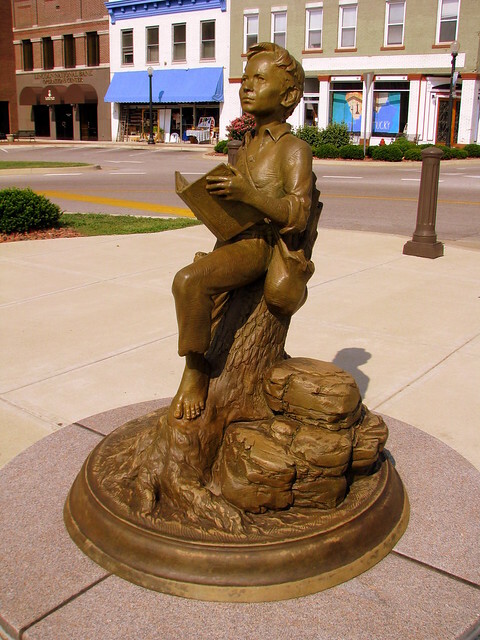 The bronze statue depicts a young Lincoln barefoot and lounging against a tree stump. It was made by the Daub Firmin Hendrickson Sculpture Group of California. As a seven year old, he is reading Webster's Elementary Spelling Book and has a linen satchel around his shoulder. I like this one. 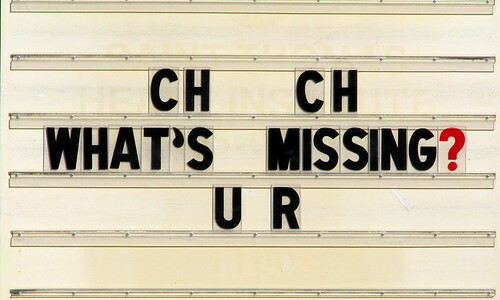 You can find all sorts of church signs from the serious to the silly all over Tennessee. Here's a small but very nice waterfall that is easily accessible but not that well known of a hidden gem. City Lake Natural Lake is a small park in Cookeville. The 35 Acre lake is the highlighted attraction here and the signs to the park and the Cookeville Parks webpage don't even mention the waterfall. We call the shield a "blind" and yes, it's to block the lights of the sign. It also houses the letters for the sign and the ladder to reach the ledge. The land owner will not allow a "tree" blind to block the traffic lights, but if you choose your spot wisely, it doesn't detract from the experience. We did experience a fire in March of 2007, but we were closed for only one night. The concessions stand suffered the most damage and was gutted and upgraded from it's 1946 wiring! Thanks for expressing interest in our Drive In. 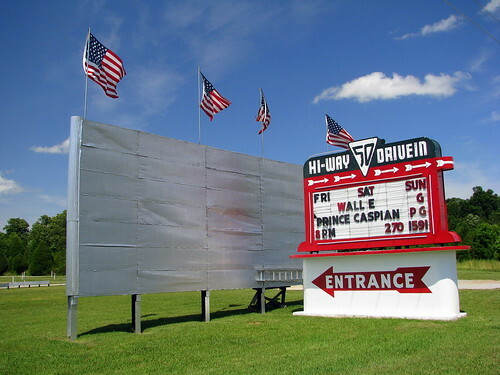 The web address is hiway50drivein.net . Palmyra is a very small town southwest of Clarksville, TN. 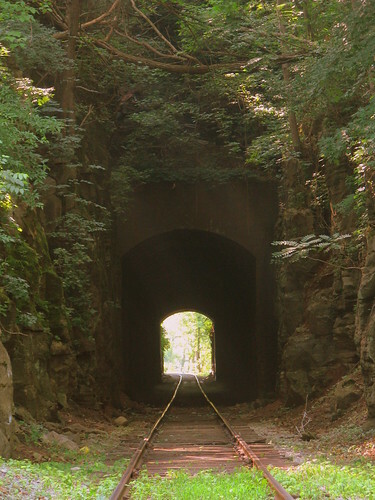 I believe the tunnel to be about 800-1000 ft. long. The old Train Tracks cross the Cumberland River in Clarksville and as it heads east is parallels the river for a while. However, near Palmyra, there is a large bluff overlooking the river and a tunnel needed to be blasted through it. There is even a cemetery above this tunnel. Today, the tracks are used by RJ Corman. They were origanny built by the Memphis, Clarksville & Louisville Railroad (M.C. & L.) which eventually became part of L&N. The tracks probably flooded in the 2010 flood. in the Great Flood of 1937, the tracks were 5 feet underwater. When looking up how old the tunnel is, I found a news article from 1859 where a railroad employee died working on the tunnel. In 1928, a boulder landed on the tracks and L&N employees blasted it, which caused a large rock to fall from 25 feet above onto them. To get to this spot, take highway 149 to Jarman Hollow Rd. and go towards the river. You will pass down a short residential street and then the road makes a couple of sharp turns until it gets to the tracks. Years ago, there must have been a ferry to cross the river at this street, but it looks like you shouldn't drive any further past the tracks. I had to U-turn on the tracks, which meant it was a good thing a train didn't come while I was here. 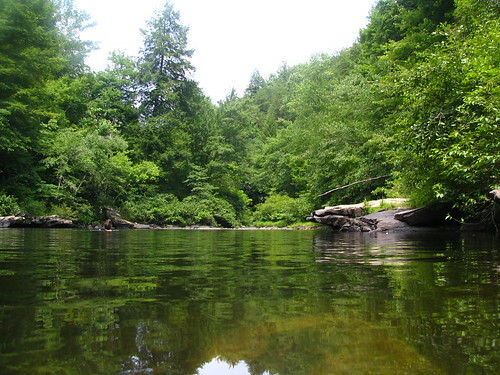 This hidden-in-the-woods place is "Blue Hole" it is upstream from Greeter Falls in its segment of the South Cumberland State Park. 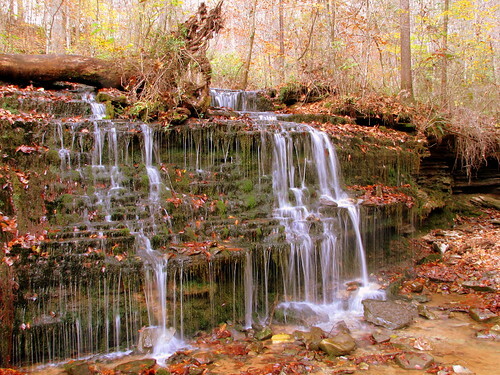 It's located near the town of Altamont, TN in Grundy County just off of highway TN 56. The trail to get here is about .6 miles from the parking area. My wife and I were tempted to stay the whole day. 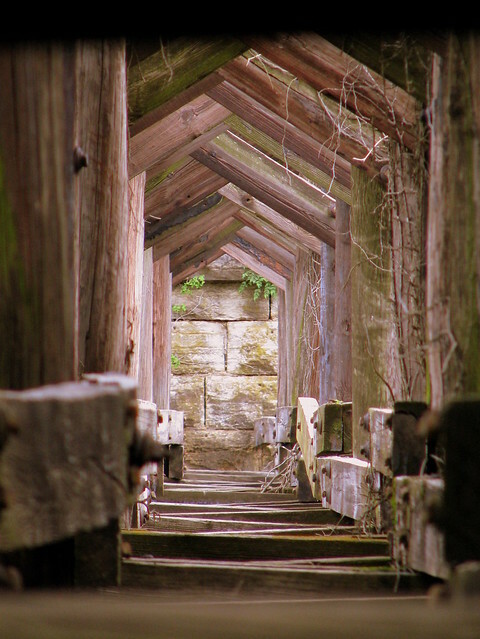 This is a section of the massive wooden trestle of the Centerville, TN Railroad Bridge. You can see through a long segment of the trestle until the end where there is a stone pier for the truss part of the bridge over the Duck River. Who Can Find the misspelled word on this barn? 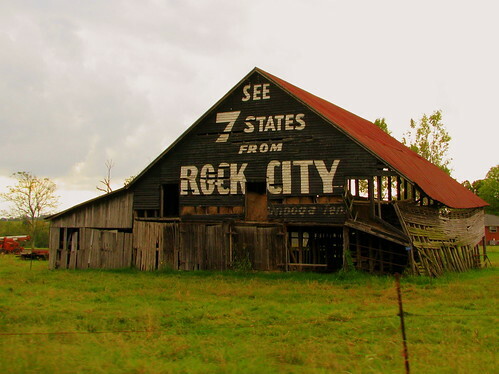 This photo is way outside of Middle Tennessee, but the Rock City barns, wherever they may be, appeal to a lot of people, so I thought I would include it today. At one time, this barn was on U.S. Highway 62 in Brown County. However, U.S. 62 and U.S. 68 were joined to form a 4-lane divided highway and most traffic was diverted off of this road. 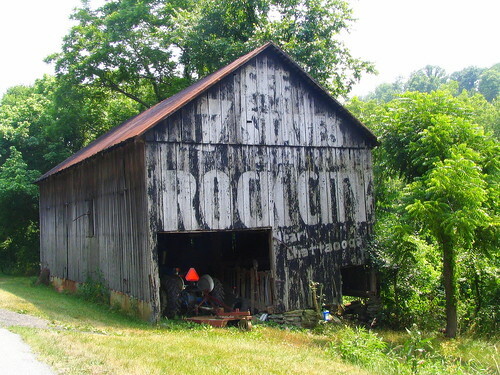 When that happened, there would be no need to repaint this Rock City ad, and fix the misspelled word. I've also heard stories about the Mail Pouch barn painters that sometimes, they would misspell the word Tobacco just to see if anyone noticed. Once someone complained, they'd go back and fix it. This barn is a couple of miles north of the city if Ripley, Oh and this road becomes Main St. into Ripley where it will meet U.S. 52, which is also now the Ohio River Scenic Byway. Oh, and it's Chattaooga that's missing an N.
When the University of the South was first established in Sewanee, TN, plans were setup to eventually have a campus chapel. 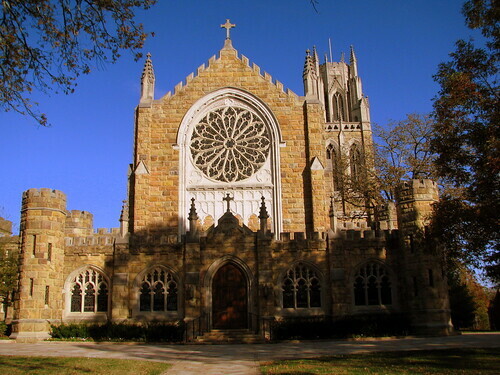 Half a century passed until the foundation was laid for the Gothic chapel made of Tennessee Sandstone. Walls were built and a temporary roof was added so that chapel could be used in 1910. The permanent roof wasn't finally completed until 1957. The tower on the right is a carillon tower, known as the Shapard Tower. The tower was donated to the school as a gift by the Shapard Family. The largest bell weighs 7,500 lbs. 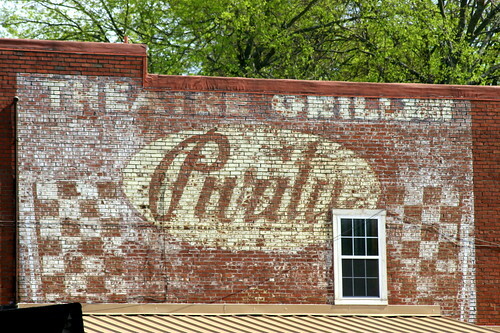 It's on the side of a building in the small downtown area of Smyrna, TN. I think the building was the Regal Theater from 1910-1958. After that, it was the Theater Grill. Today, I believe it's vacant. Located at the corner of Old Natchez Trace and Old Hillsboro Rd. (TN46) in Northwest Williamson County. 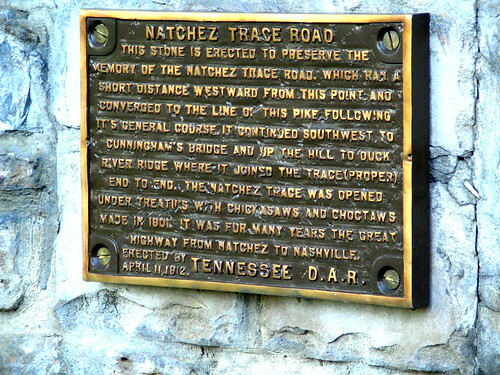 The marker signifies that about 1500 feet from here, the road follows the path of the historic Natchez Trace. In this area, the Trace follows the side of the Harpeth River and there's a couple of swimming holes popular with the locals. 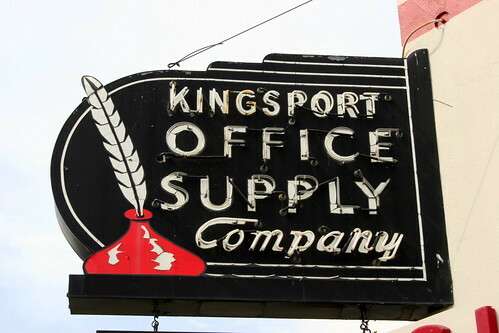 Here's where I see the irony in this photo - When this sign was new, it was designed to show an old fashioned quill pen and ink well. 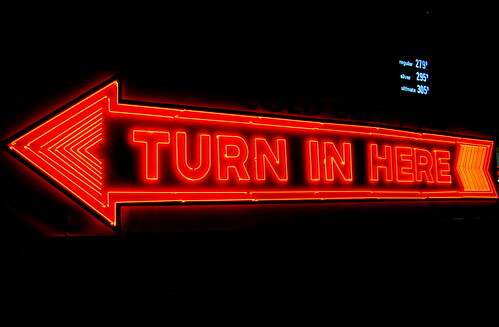 However, today this type of neon sign would be considered old fashioned. 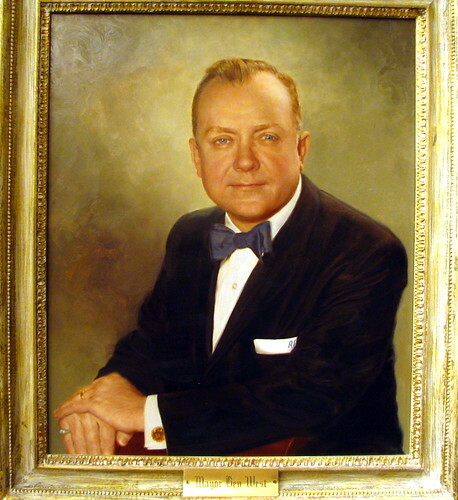 Ben West was elected mayor of Nashville three times and served in that role from 1951-1963. Perhaps his most notable achievement was making Nashville the first southern city to desegregate public facilities. This portrait is in the downtown Nashville Library. 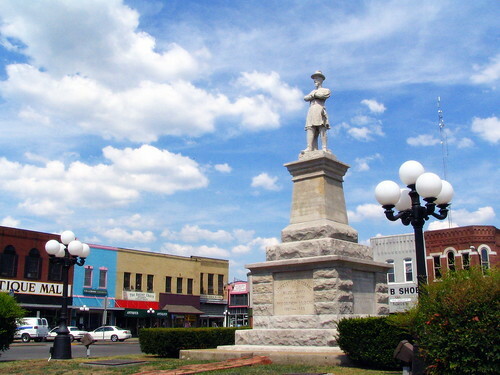 In the center of the town square is a statue of Confederate Gen. Robert Hatton. Since this photo was taken about 4 years ago, a small fence has been built around the statue. There are a lot of Antique stores on the town square. I think they claim there's over 20 in the heart of Lebanon. Here's an easily accessible waterfall that I drove around in the area 3 or 4 times without getting right up to it. When you know where it is, you can see it from the street, Hickman Springs Rd. There used to be cars made in Nashville, but of course it was nearly 100 years ago. 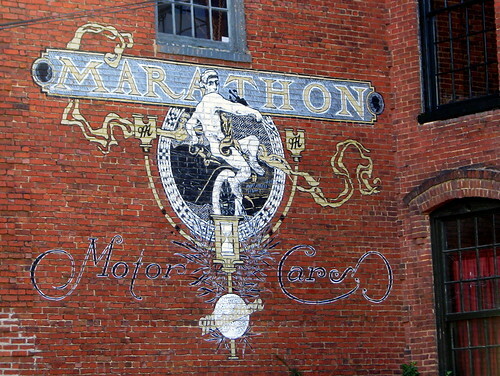 The building still remains and has been converted to offices with the old Marathon Logo painted on the side of the building. Listed on the National Register of Historic Places as the Mauris-Earnest Fort House. This house is located just south of Chuckey, TN in Greene County, TN along Chuckey Pike. The house was built ca. 1784 and is one of the oldest houses in Tennessee. 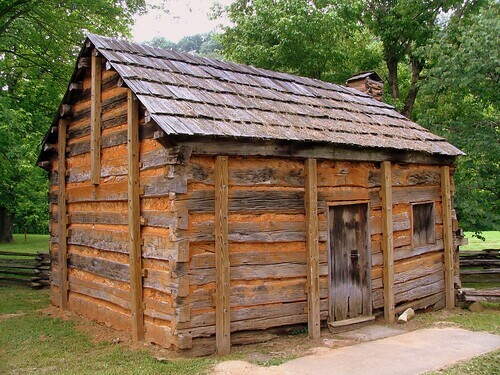 It was built as a fort back when defending Cherokee threats were important. The house is on the banks of the Nolichuckey River and the surrounding farmland is now its own entry on the National Register, listed as the Earnest Farms National Historic District, and is the oldest single-family operated farm in the state. This house also reflects German log contruction traditions brought to America by the Earnest family. 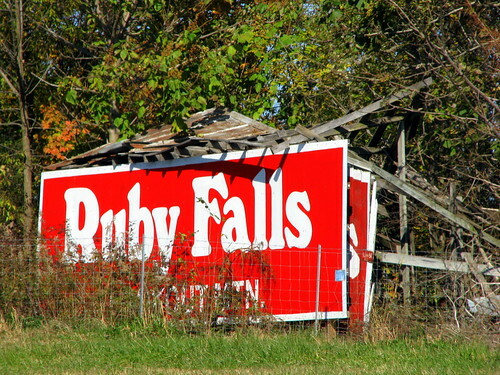 This Ruby Falls barn was probably the first one I ever photographed, back in 2005. That was back in the day when the primary color in their ads was turquoise. Since then, it appears as if the barn is about to fall apart. Since 2005, it looks like they repainted in with the Ruby color scheme. However, since the barn is crumbling, they must have felt it was easier to slide a new durable sign in front of the old one on the side of the barn. It is located just north of the Mile 127 marker on Interstate 24 on the southern side of Coffee County. When workers were renovating the alley between the Park Theater and the Cumberland Bank in the older business district in McMinnville, Tn, they discovered this sign for the famous Sedberry Hotel. Contractors decided to leave this part of the sign showing and framed it with new brickwork and lights. The Sedberry Hotel was one of the premier establishments in the Midsouth in the early 1900s, playing host to many of the era's celebrities and foreign dignitaries, reportedly including a nephew of the Czar of Russia, politicians Huey Long and Cordell Hull, gangster Al Capone and baseball great Babe Ruth, all of whom either stayed or dined at the Sedberry. At the 2009 Tennessee State Fair were several intricate cake designs, and while this wasn't one of them, it is still nonetheless fascinating. RC Cola and Moon Pies have been described as two great things that go great together. If you're still unsure, another slogan is "It's a Southern thing." 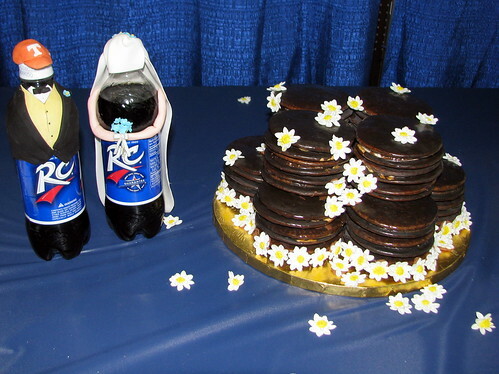 And the RC Cola bottles are getting married while the groom is wearing a UT hat, which would be another southern thing. By the way, Bell Buckle's RC Cola and Moon Pie festival is coming up next weekend. 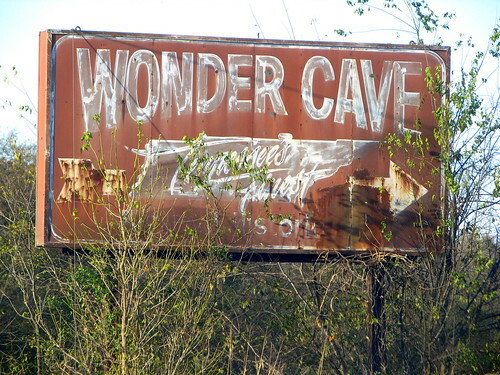 This sign points the way to Wonder Cave, once a popular middle Tennessee tourist attraction. 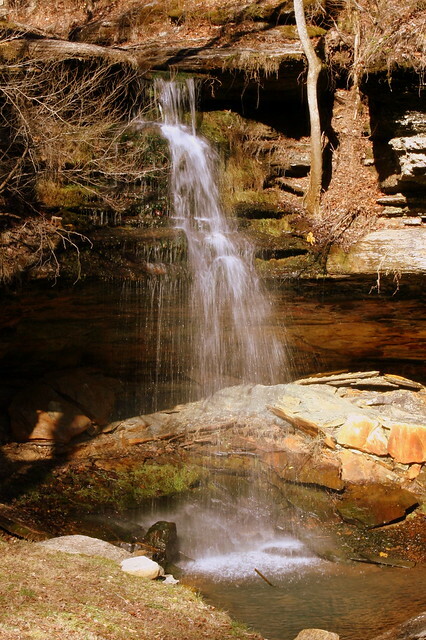 The cave is located at the base of Cumberland Plateau in Grundy County. Back in the days of the Dixie Highway and later highway US41, the turn to get to the cave was located at the last turn before making the ascent to Monteagle. Everyone travelling from Nashville to Chattanooga would have passed through here. As has been the case with many "impulse" tourist attractions, the opening of the interstate killed off this business. Now people take I-24 through the area and the Cave soon went out of public. It reopened again but soon closed again circa 2000. Even though it's not open commercially these days, I hear it's possible to get in the cave if you do a little research. Did you know that a several ton ball of marble will float on just an inch or two of water? 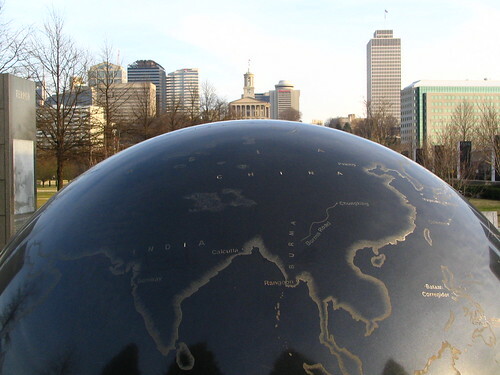 Well, it can, and there's one at Bicentennial Mall at downtown Nashville to prove it. (I've also seen one at Ripley's Believe It or Not Museum in Gatlinburg.) It takes a little bit of effort but you can spin the sphere. The one here also serves as a globe - Tennessee is somewhere on the other side. In the background, you can see the State Capitol, as well as other downtown buildings. Tennessean and hero Alvin C. York was one of the most decorated soldies in World War I. On Oct. 8, 1918, while leading a small patrol through the Argonne Forest in France, Sgt. York had the assignment to eliminate a flank of opposition machine gun fire that was halting his regiment's advancement. York found himself alone facing a German machine gun unit and he took them on with only a rifle and a pistol. The fight ended with over 20 German soldiers dead and another 132 soldiers surrendering along with their four oficers and 35 machine guns. For his efforts he was awarded a dozen medals including the Congressional Medal of Honor. After the War, he returned to his family farm in Pall Mall, nestled in the Tennessee Mountains. York never seeked to capitalize on his fame, and instead led a quiet life. 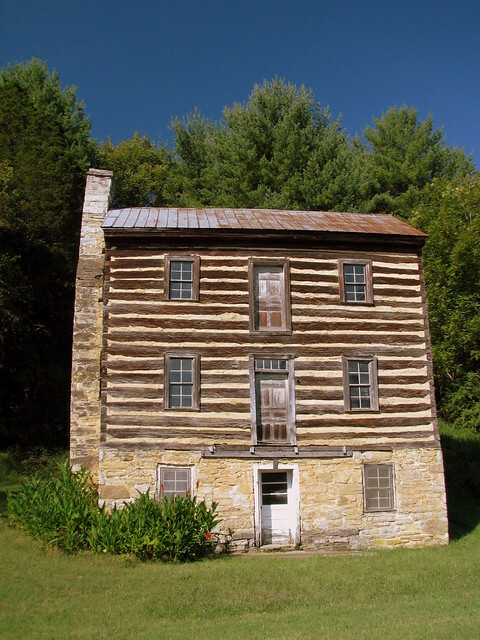 York's Family farm, grist mill, and burial site are now maintained by Tennessee as a State Historic Park. 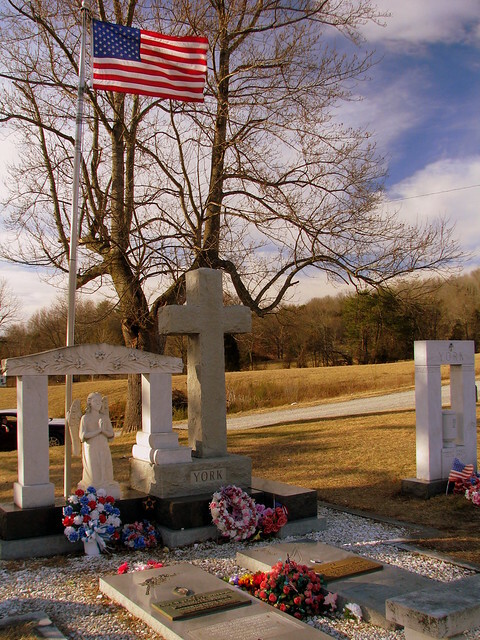 The Cemetery, known as Wolf River Cemetery was established in the early 1800's. The Valley's first settler and ancestor of Sgt. York, Conrad Pile, is also buried in this cemetery in an unusual above-ground grave. Sgt. York died on Sept. 2, 1964. The cemetery is accessible from the rest of the farm by a 10 minute drive or a shorter walk that includes a new pedestrian bridge over Wolf Creek. The drive also passes a Sulfur Spring which was very pungent. The "ou" in You is also underlined. This barn is located on U.S. Highway 11 in Dekalb County, Alabama. US 11 runs from Birmingham to Chattanooga. This barn was painted decades ago. Located on the Knob Creek Farm, which is a few minutes north of the Lincoln Birthplace on U.S 31E. He lived here from ages 2 to 7. This one is not encased in a large concrete temple. 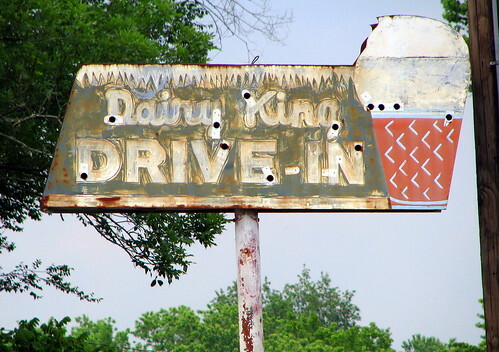 When I was a kid and would ride past Dairy King in South Nashville on East Thompson Lane, I just assumed it was trying to be a cheap knock-off of Dairy Queen. In fact, it's a popular restaurant that's been there for several decades. That was, until the May 2010 flood. Their building was next door to Mill Creek, and when the creek rose, it did permanent damage to them. They moved about half a mile up the road, but the last time I looked they left their sign at their old location, which I believe is now a place to buy used clothing. Here's a photo I took many years ago. 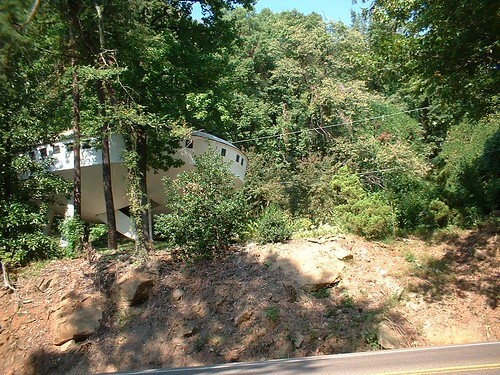 This is the crazy UFO house in Signal Mountain, TN. This is just north of Chattanooga, where US Highway 127 winds up the mountain. It's located at a place that used to be known as "The W" as there are a few sharp turns there. The house was built in the 1970's. You can see the entrance to the house, which is a staircase that leads to the main entrance at the bottom of the middle of the UFO. For a while, the stairs would retract upwards, but that feature broke after a few years. It went for sale about 4 years ago, and the asking price was $180,000.